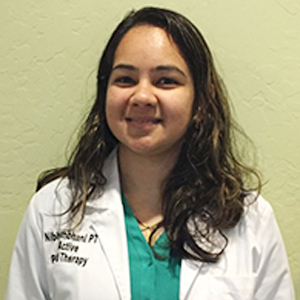 Nibha received her Masters in Physical Therapy from Massachusetts General Hospital Institute of Health Professions, Boston MA. Her clinical experience includes sports orthopedics and injuries, pre and post-operative care, aquatics and complex medical conditions. Nibha is dedicated to evidence-based practice for optimal patient care. When she is not working Nibha enjoys spending her time with family and friends. She is always looking for ways for her further education and to stay current with the research.